Here is my first one. I embroidered one of Anni Downs's patterns (all embroidery patterns shown here are by Anni), and reverse appliqued it onto wool using blanket stitch with matching thread, and running stitch by hand with white DMC floss. Finally, the "Owl in the Woods" as I call it. I used one of the designs from the book Iris Quilting (see my review here) and machine appliqued it onto cotton using blanket stitch and monofilament. This giveaway will close September 17, the last day of the hop, at 5pm. A randomly chosen winner will be announced on September 18, here at this blog. I will ship internationally, too! 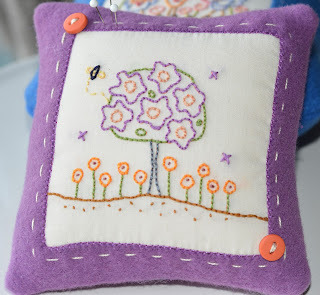 Your embroidery is gorgeous :-) (please don't enter me in the giveaway - I have enough things to make at the moment! Love your embroidery pin cushions. The owl in the woods is great! 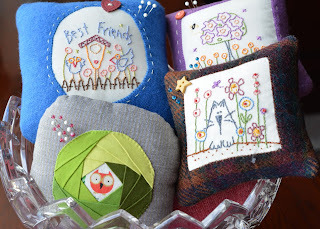 I am enjoying this blog hop, great show of pin cushion... what an inspiration! Thanks for adding yours, they look great, I like the different methodes you used (stitching, piecing, patching) and the fabric you used! Thanks for sharing. Oh I love your wool pincushions with the stitcheries!So sweet and delicate. An the owl is so adorable and lovely!Great inspiration! I am a follower of your blog and look forward to see to your wool projects! The embroidery stitching on the pincushions is sew sweet. And I like the way the fabric surrounds the owl. Great work. Denise you are so creative. 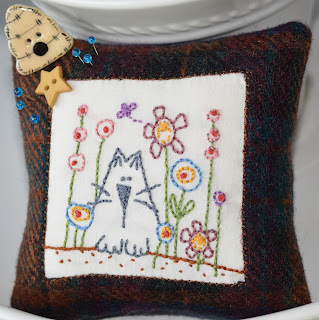 I would have never thought about making a stitchery pincushion. I love it. Cute pin cushions! Thanks for sharing. I'm a follower - with Bloglovin'. Thanks again. Your pincushions are so lovely, I keep meaning to try embroidery sometime. I think the owl is my favourite. Thank you for a lovely giveaway. Very nice projects Denise!! I like the owl in the woods..cute! I follow your blog via Bloglovin', thanks for the chance!! Just beautiful....I love pin cushions of all shapes and sizes, especially those made of wool! Denise, your embroidered pin cushions are all so wonderful! I am a follower. I love your embroidered pincushions and the one using Iris folding. One of my teacher friends does that with paper. It's beautiful! Thanks for sharing. They are beautiful, thanks for the give away. Oh these are so lovely!! Gorgeous pincushions!!! Well done! Yay - I am a happy follower!! all 4 ( and no doubt the hiding one) are very cute! Good work! Do you work with wool alot? I guess so if you're going to do the wool hop too. I've just started appliqueing with wool on a BOW by Primitive Gatherings this summer. LOVE it! I'll be back to see you for the wool hop. Beautiful work, I love the paper pieced with the owl. The pincushions are adorable! I love them all but the kitty one is my favorite. Spectacular pincushions! You did a wonderful job! Simple design with fabulous attention to detail makes for a wonderful project! Prolific! I just love your owl in the woods! I love that owl pin cushion and then I saw your BUTTONS!! gosh... I NEED those ;) I have quite a weakness for owls.... If I don't win, can you tell me where you bought them? Lovely pin cushions and Saphpire's is my favorite. I am late to the party on the owls but with the pin cushion hop I have learned they are really hot! Thanks for sharing. WOW How cute, they are just beautiful! You do very neat embroidery work. Thank you for sharing I enjoyed them. I just love the embroidery. It adds such a lovely touch! Denise, too cute ! All of them ! I can't choose a favorite....I love the owl, but then again....nope, can't do it, can't choose ! If I win, p-l-e-a-s-e all I want for Christmas is the chicken pin cushion pattern ! OMG right up my ally ! What adorable small embroideries. And that owl is just so cute. Thanks for the giveaway. These are so cute. I can't wait to try and make these. Oh yes, and I'm your follower too. Happy to have the chance to win the cute buttons. I am a follower as well!!! Your embroidery is beautiful. Love all of your pincushions. Thank you for sharing. Very pretty pin cushions and I love your embroidery. I have been doing a lot of that lately and yours is done so well. Those are so cute!!! Your stitchery is beautiful. Denise I love your pincushions! I was just thinking they would be perfect for your wool blog hop and then saw that you did indeed hold one out for that hop so i am looking forward to seeing it. You do beautiful embroidery work!!! I am a fairly new follower on GFC. I love those cute owl buttons too. Thanks for giveaway. Your pinnies are so cute, I love your embroidery! Those tiny owl buttons are very cute. Thanks for the giveaway! I love these pin cushions! The embroidered ones are just darling! Love the kitten! You've been a busy stitcher. They turned out great! I'm a follower! Love the owl buttons of course. Beautiful stitchery! Thanks for the great giveaway! I am just in aw of the stitching that a few of you ladies do out there and you cushions are just awesome. Beautiful embroidered pin cushions! Thank you for sharing. I like the embroidery in your pincushions, very creative. I follow via GFC and email! Your embroidery stitches are perfect to go along with your beautiful pincushions each a little work of art! Please enter me in your giveaway! I follow by GFC love your creations! What great pin cushions! You've been busy! Adorable... Ooh the cat one is just too cute! Your pincushions are so pretty! I like your pincushions, especially the Owl in the Woods one. I am already a follower of your blog by email. All are lovely. I really like the owl. Great job and thanks for the giveaway chance. Nice pincushions! The cat is my favorite! Love your embroidery, you do very beautiful work. Gorgeous pincushions - I love them all! Just amazing what a little hand emb will do for a project! Am also one of your loyal followers, thanks so much for the chance to win! Aww.. Love the pin cushions. They are so cute. Thank you for sharing. I already follow you by e-mail. Now I am a follower. They are all super pretty - I love the way you frame the embroidery for them! Your pin cushions are adorable! Adorable little kitty. Lovely stitching! I love all your pin cushions. It is hard to pick my favorite they are all so nice. What a great give away. Thanks for having one. Stunning embroidery. Wool and buttons showcase them beautifully. I really like the owl in the woods, too. So cute. Thanks for sharing and for offering a giveaway. Fun hop, interesting seeing all the different cushions. 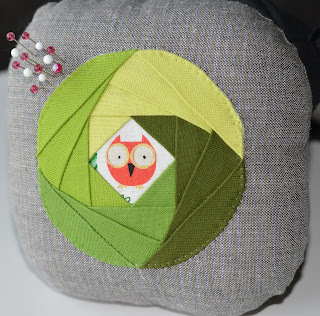 I absolutely love your owl pincushion...I am a sucker for owls! Your pincushions are all lovely and quite delicate looking. the kitty hiding out is wonderful.Great work. Oh such lovely pincushions. I love the Best Friends one. Really great. Beautiful stitcheries! You are very clever! Love all of them! love your pincushions, your stitchery is wonderful. also like the framing on the owl. Beautiful pincushions. So much handwork. Such nice detail to your pin cushions. Very nice! Love the embroidery on the pincushions, thanks for a chance to win.. I am your newest follower and your pincushions are adorable! Would love a chance to win! Totally beautiful pincushions and your embroidery is sweet and so lovely. The blue is a favorite. The owl is cute and I wonder if it's done by paper-piecing. Wonderful! 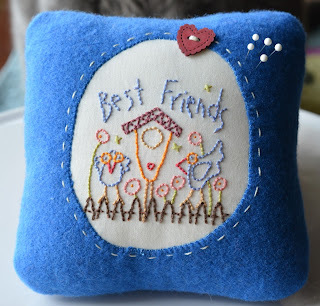 Love the stitched designs on your pincushions...too cute! I think your pin cushions are just adorable! I especially like the one with your cat Sapphire. My cat Popeye always helps me when I'm sewing. I have only made 1 pin cushion in the same style as the tomato ones, so I'm looking for ideas. I guess I could make one with my cat on it! Thanks for sharing! I am a follower on Bloglovin'. your embroidered pincushions are delightful! They would make gifts and become heirlooms! Thanks for the inspiration. I follow your inspiring blog via Bloglovin. Your stitching is beautiful--so perfect. I love your pincushions, I really like embroidery. I follow you with bloglovin, thanks for the giveaway. I love your embroidery Denise. Your stitches are perfect. My favorite is Sapphire. So far I like your pin cushions the best! Great inspiration for me to do some simple shapes with a little embroidery. They are all so elegant and wonderful. Love the embroidery and wool together. Your pincushions are so pretty with the stitchery. I like the kitty one. I would love to go in the draw. I love your pincushions , the embroidery designs are so sweet and who doesn't love owls . Thanks for sharing with us. I follow by email and appreciate the chance to win. Your stitcheries are just gorgeous. What beautiful pin cushions they do make! Love the embroidery. Very cute. I just love your pincushions and your embroidery! Your kitty one is my favorite!! They are all so cute. I just found your blog and am planning to read a lot more of your posts. Thanks for the chance to win. I love your wool pincushions. I haven't worked with wool before, and now I can't wait to give it a try! And now, I am your follower by e-mail. thanks for the inspiration! They are all lovely - looks like you have had lots of fun! Thanks for sharing and sorry I am late visiting. Your pincushions are adorable. Those little stitches..... very beautiful! Did Saphire help at all? Or is she like my cat, who likes to just sit and steal stuff from the desk? Denise, I love your homage to the kitty. And the owl turned out amazing! 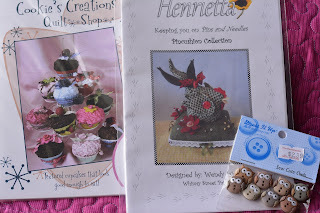 Thank you for offering the patterns and amazing owl buttons, you're so kind! All of your pincushions are darling. Thanks for sharing with us. Lovely pincushions and I really like your fabric and color you use on them. Lovely blog with lots of wonderful work. lovely pin cushions. How fun that you could incorporate embroidery into your entries. I have been following since an earlier hop. THX for the giveaway opportunity. Nice work, like the cat one best. I'm a follower, thanks for the chance! oohhh! I love all of them! Love the orange on the second pin cushion and the owl one is so sooo cute. I really love them all. Thanks for sharing. Wonderful pincushions, thank you for sharing! Hi!!! These are very pretty and cheerful!!!! I love your kitty!!! 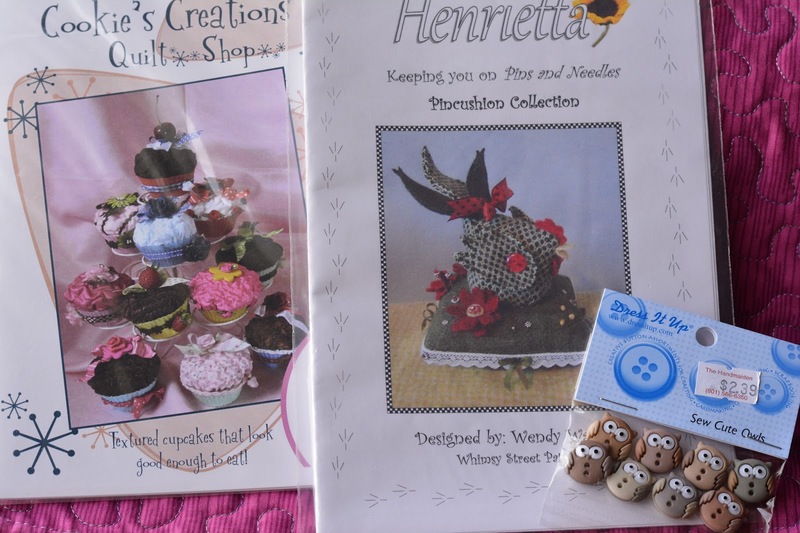 Denise, your little embroidery pincushions are so adorable - and that little fussy-cut owl block, amazing! So darling.